PT stainless steel platforms are durable industrial scales that are used to weigh heavy or oversized objects on a warehouse floor. 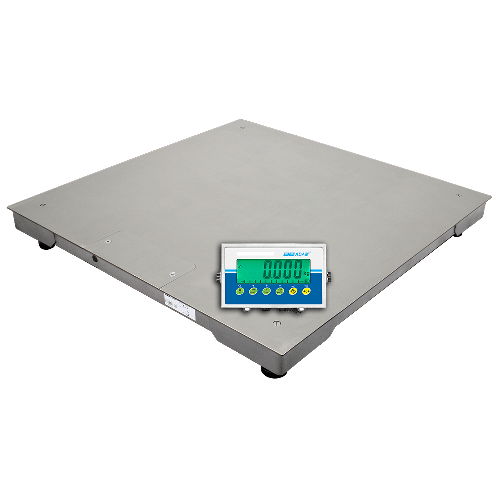 Ideal for weighing food products, chemicals, pharmaceuticals or mining materials, the PT stainless steel platform features an IP66 rating for protection against water and dust. Dust-proof and waterproof load cells are sealed and boast an IP67 rating. An easy-to-clean grade 304 stainless steel pan can tolerate frequent washing, while the sleek brushed surface helps prevent the accumulation of food and dirt particles. The reinforced frame beneath the platform provides strength and support. The PT stainless steel platform can be paired with an Adam indicator to provide enhanced features and functions such as dynamic animal weighing used for weighing livestock and checkweighing for ensuring product standardisation. For more information about the PT stainless steel platform, please contact us.